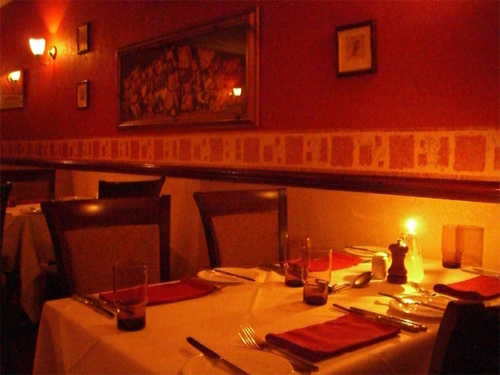 Set in the heart of the historic old town of Bridlington, Burlington's is a husband and wife run restaurant, which has been open since 1990. David is in charge of the kitchen, while Judy welcomes you as you arrive. Whilst enjoying a pre-dinner drink in the comfortable bar, there is a choice of menus; view the a la carte menu which is frequently changed, or choose something from the excellent value Early Bear menu. After choosing, you will be shown through to your dining table. The restaurant has two dining rooms, the larger room to the rear of the bar and a smaller, more intimate room which can be viewed from an arch from the bar. The food is David's forte, and ranges from locally caught sea-bass to traditional steaks - with influences from all over the world, David injects Thai twists and Italian freshness into some very English dishes. Around the restaurant there are many teddy bears to be seen and people often ask about them, as is often the case with these things there is a story behind it all. When we opened the restaurant 25 years ago, David bought me (Judy ) a teddy bear for good luck, he sat on the bar, until one evening when he disappeared , of course customers noticed he had gone and started to brings bears as gifts and thank you presents, these of course had to be in the restaurant and as they say the rest is history.